Formalin-fixed paraffin-embedded (FFPE) tissues have been used for many years for pathology studies in laboratories all over the world. Due to the global adoption of the technology, FFPE samples easily represent the largest collection of well-characterized and fully documented biological specimens currently available to researchers. Moreover, cross-linked DNA is very stable at room temperature for many years, providing an easy storage solution of the material for genetic analysis. The drawback of using FFPE samples as a DNA or RNA source lies the complexity of the extraction steps: the chemical procedure required to fix the tissue samples result in the formation of chemical bonds between the different biochemical molecules present in the cells and reversing this process often results in nucleic acid fragmentation and loss. This process is even more complex when a large number of samples need to be processed at the same time. 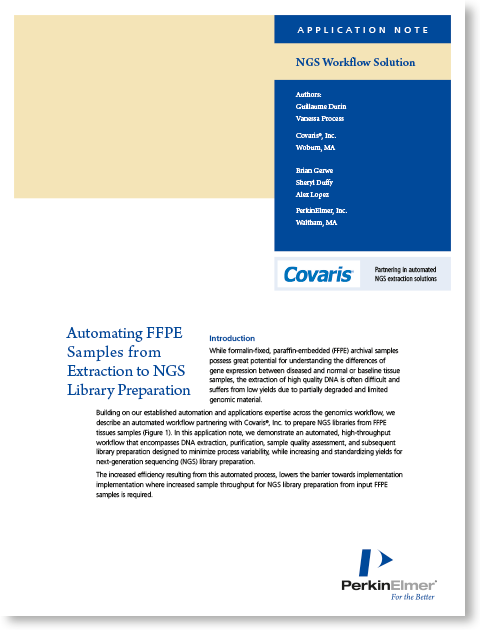 PerkinElmer has optimized an automated DNA and RNA extraction protocols from FFPE samples in collaboration with Covaris®. By integrating Covaris® truXTRAC® FFPE DNA and RNA extraction kits to the chemagen™ nucleic acid extraction workflow, researchers can now rely on the purification of high-quality nucleic acids even from difficult-to-extract FFPE samples.